Central Oregon just east of the Cascade Mountains is known to be a popular rock and mineral collecting area. Productive sites of Crook, Jefferson, and Deschutes Counties offer a variety of gem-quality minerals including famous thunderegg, petrified wood, limb cast, agate, jasper, and opal. Opal is found at Opal Butte in Morrow County but this area is closed to public digging. Jefferson County has popular areas with minerals and fossils such as petrified wood, geodes, thunder eggs, and jasper. Deschutes County is well-known for petrified wood. The Warm Spring Reservation in Wasco and Jefferson Counties produces black and white colored agate. Crook County is the most productive. Petrified wood, limb casts, thunder eggs, agate, and jasper are found here. A wide variety of minerals, semiprecious gemstones, and rocks is available on public lands managed by the Bureau of Land Management (BLM) and U.S. Forest Service. Also, there are privately owned sites, open to mineral collecting for fees. There may be private claims in some areas. Check No Trespassing signs. Here is a list of the most popular sites, available for recreational rockhounding. But before accessing the sites and collecting any rocks, contact the local government agency to find out the most up-to-date information and regulations. Road Access: Not maintained. A high-clearance vehicle is recommended. From Prineville, take Highway 27 and drive 33 miles to Bear Creek Road (Do not take Little Bear Creek Road). Turn left and go about 5.5 miles, turn left just before fence (off road) or park your car. Go north along the west side of the fence. The Bear Creek area is known for its beautiful red and green moss agate, nodules, and petrified wood. Road Access: Not maintained. A high-clearance vehicle is recommended. Seasonal road closure. From Prineville, head southwest via Highway 380 to milepost 14, turn right just beyond huge Eagle Rock and go 0.1 miles. Drive upstream then turn left. The Eagle Rock area produces beautiful but scarce red and black plume, dendritic, moss agate in a rhyolite base. Diggings are available at the base of the large standing rock. From Prineville, head southwest via Highway 380 to milepost 33, turn right onto Drake Creek Road (NF-16), drive 4.4 miles. Turn right onto Road NF-1680 and drive 1.5 miles to Road NF-1690, turn right and continue 0.6 miles to the Maury Moss Agate Parking Area. Hike downhill for diggings. The Maury Mountains area produces beautiful but scarce varieties of moss agates with gold, green and red hues. Sometimes dendritic and white plume agates are found. Road Access: Maintained County Road. Seasonal road closure. From Prineville, drive east via Highway 26 to milepost 48, turn right onto Road 2630 (Pisgah Lookout Road), drive 3.5 miles to NF-2210. Turn right onto Road NF-2210, and shortly right onto NF-300 and then go for about 2 miles, turn right to diggings at the end of the road (provided by Prineville Chamber of Commerce). The Green Jasper area produces beautiful but scarce green jasper. From Prineville, head southeast via Highway 380 Post/Paulina to milepost 50, turn right onto Congleton Hollow Road just beyond the river, and drive a little more than 3.9 miles to the first site on the left. From this point, drive next 1 mile along the road. A few spots are located on the slopes of both sides of the road. From Prineville, head southeast via Highway 380 Post/Paulina to milepost 43, turn right on Campcreek Road between mileposts 43 and 44, drive for 9.3 miles. Turn left on the road Forest Road 6574 just after you pass the rock quarry and drive approximately 1.9 miles, take the left fork and continue about 1.7 miles to a junction, keep right and drive 0.5 miles to the next fork. From this point, continue 1.1 miles to the site A on the left side of the road. From the site A, follow next 0.7 miles then turn left on the primitive road for next 0.5 miles. The locations Congleton Hollow and Dendrite Butte are known as Limb Cast Collection Areas. Limb Cast is Fossil Wood when quartz deposits in the volcanic ash cavities which before were occupied by wood. After massive mudflows, the origin forests were buried. Through the time plants and woods decayed. Limb Casts is Fossil Wood when quartz deposits in the volcanic ash cavities which before were occupied by wood. The cavities filled with chalcedony and other minerals including manganese, forming beautiful clear, gray, or pink agates, often dendritic within the casts. There are a few productive spots, located approximately 55 miles east of Prineville. From Prineville, drive east via Highway 26 to milepost 34, turn right onto Ochoco Creek Road, drive 3.4 miles to NF-22. Turn left onto Road NF-22, follow 4.4 miles and turn right to stay on NF-22 and then shortly left onto NF-50. Continue 1 mile to the top of the ridge. The Vistaite area produces beautiful but scarce jaspers, green and buckskin rhyolite. A shorter route (provided by Prineville Chamber of Commerce) with narrow and winding sections. From Prineville, drive east via Highway 26 to milepost 49, turn left onto Grant Springs Road (NF 27) for about 6 miles, turn left on Road NF 2700, then take NF 50 to Whistler Springs Campground. Do not use this route in wet weather. A longer but gentle route. From Prineville, drive east via Highway 26 to milepost 49, turn left onto onto Grant Springs Road (NF 27) and go 0.8 miles. Turn right onto NF 2730 for 11.2 miles, then left onto NF 2730-200 for 5 miles to NF-27, cross the road and go 0.3 miles to Whistler Springs Campground. Warning! The area is bounded from the southern end by Mill Creek Wilderness. Watch boundary signs. White Fir Springs. From Prineville, take Highway 26 east to milepost 41, turn left onto Wildcat Mountain Road (NF 3350) and drive 5.5 miles (always take a left fork). Look for signs. White Rock Springs. From Prineville, take Highway 26 east to milepost 41, turn left onto Wildcat Mountain Road (NF 3350). Go about 7 miles to White Rock Springs. Look for signs. The White Fir Springs and White Rock Springs areas produce thundereggs that are filled with red, yellow or beige jasper. It is hard to remove materials from rhyolite matrix. There are a few locations on this site. From Prineville, drive east via Highway 26 to milepost 25, turn left on a gravel road just before milepost 26. Drive about 50 feet and turn left again on a dirt road. After the first few hundred feet, it will be an area to park. From the parking area, hike up to cliffs, then follow to the north. From Prineville, travel 30.7 miles south via Highway 27 (Main Street). Turn left on a dirt road, just 0.1 miles south of Salt Creek Road. Follow about 0.75 miles to the collection site. From Bend, follow east via Highway 20 about 50 miles to Van Lake Road. Turn left onto Van Lake Road and drive 10.6 miles, then turn right onto Price-Twelvemile Road and continue about 2.5 miles. Hampton Butte is well-known for its rare green petrified wood. Other colors such as red, yellow, brown can be found. Managed: Private, Wheeler High School, open to the public for small fees. The ridge behind the high school is Oregon's only legally accessible fossil dig bed that produces plant fossils including metasequoia, the ancestors of sycamore, maples, oaks, rose, and alder. Also, you can find aquatic vertebrates, a bat specimen, and previously unknown species of salamander. Fossil materials near the bottom of the John Day Formation had been deposited at the edge of the ancient lake about 33 million years ago. Located northeast of Madras, the Richardson Rock Ranch is known for its famous Priday Plume Agate. The highly-prized in the world those agates have the brilliant red and yellow plumes in a transparent matrix. The best thunder eggs containing agate are also found on the Richardson Ranch. Marli B. Miller. Roadside Geology of Oregon. 2014. Mountain Press Publishing Company Missoula, Montana. William A. Kappele. Rockhounding Nevada: A Guide to the State's Best Rockhounding Sites. 2010. A Falcon Guide. Lars Johnson. 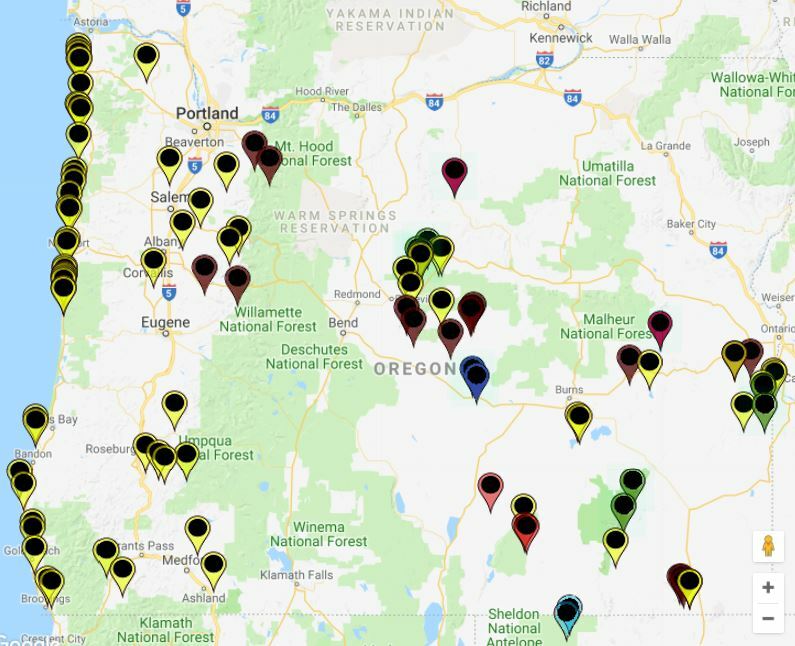 Rockhounding Oregon: A Guide to the State's Best Rockhounding Sites (Rockhounding Series). 2014. A Falcon Guide. William A. Kappele. Rockhounding Nevada: A Guide To The State's Best Rockhounding Sites (Rockhounding Series). 2011. A Falcon Guide. Dan R. Lynch, Bob Lynch. Rocks & Minerals of Washington and Oregon: A Field Guide to the Evergreen and Beaver States (Rocks & Minerals Identification Guides). 2012.